Ivan Shishkin is a well-deserved and skillful master of the Russian landscape. The artist’s work was based primarily on a thorough study of nature, which was a big step in Russian art. The landscapes of Ivan Ivanovich were realistic, reflecting the richness and beauty of “living” nature in all their wealth. Shishkin was and remains one of the revolutionaries of a realistic direction, praising Russian forests. To this day, the works of the master have not lost their attractiveness and continue to delight the audience with chased drawing and variety of forms. 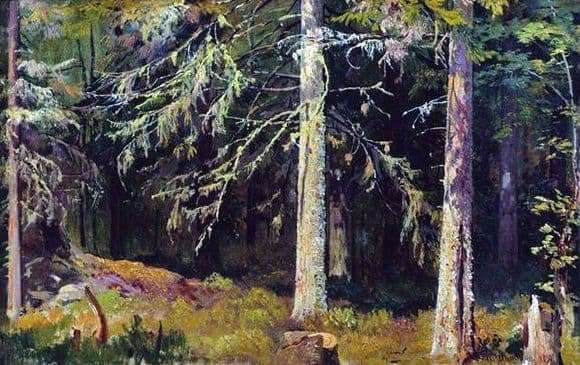 The canvas “Spruce Forest” was created in 1890, referring to the late period of creativity and incorporating all those characteristic techniques that Shishkin developed during the years of hard and fruitful activity. Accurate and detailed transfer of trees and plants, skillful underlining and highlighting of the most subtle features – the breed, color, texture… The summer state of nature depicted on the canvas is filled with a wealth of shades and unity of the overall range. With enthusiasm working on the epic and monumental composition, the master turns to the light gradation and strengthening the principle of contrasts. The midday sun touches the earth’s rays under the trees and climbs up on the centuries-old trunks of the pines, emphasizing the colorful color palette and the perfection of a corner of the forest world captured on canvas. Shishkin gives preference to the landscape for good reason, considering nature to be an inexhaustible inspiration for creativity and capable of presenting new and surprisingly picturesque and vivid images every time. The paradox of the painting is that Shishkin’s painting style and realistic images crowd out any emotional characteristics of the plot. A perfect study, but only one of many other random and similar “similar” to reality. Many critics who recognize Ivan Ivanovich’s unquestionable talent have pointed out the lack of poetic and emotional experiences. This led to the fact that Shishkin’s skill as a draftsman lost his advantage in color drawings, rather than in their monochrome variants. To put it mildly, critics, thus, the masters reproached the master in the proximity of his works to photography. Nevertheless, the works of Ivan Shishkin created a unique native image of the nature of Russian open space, close to the popular ideal and bearing the age-old Russian unprecedented scope.